Hit the geometry wall? Get up and running with this no-nonsense guide! Does the thought of geometry make you jittery? You're not alone. Fortunately, this down-to-earth guide helps you approach it from a new angle, making it easier than ever to conquer your fears and score your highest in geometry. From getting started with geometry basics to making friends with lines and angles, you'll be proving triangles congruent, calculating circumference, using formulas, and serving up pi in no time. Geometry is a subject full of mathematical richness and beauty. But it's a subject that bewilders many students because it's so unlike the math they've done before—it requires the use of deductive logic in formal proofs. If you're having a hard time wrapping your mind around what that even means, you've come to the right place! Inside, you'll find out how a proof's chain of logic works and even discover some secrets for getting past rough spots along the way. You don't have to be a math genius to grasp geometry, and this book helps you get un-stumped in a hurry! 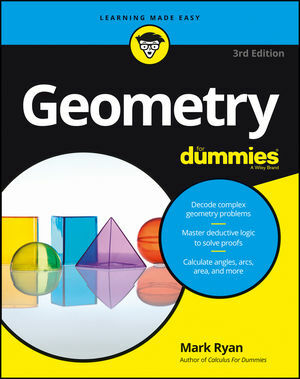 There's no reason to let your nerves get jangled over geometry—your understanding will take new shape with the help of Geometry For Dummies. Mark Ryan is the founder and owner of The Math Center in the Chicago area, where he provides tutoring in all math subjects as well as test preparation. Mark is the author of Calculus For Dummies, Calculus Workbook For Dummies, and Geometry Workbook For Dummies.